Should You Fire Your Landscaper? Here Are Four Pro Tips. Break ups can be hard. Unless you are using a Scag zero turn mower, cutting things off isn’t always easy. So when should you throw in the towel on the relationship with your current lawn care provider? I am a 20 year veteran in the industry, and I’d like to offer my guidance. 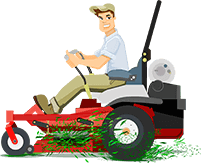 Whether you are hiring a professional to mow the lawn in Franklin, Tn or to cut the grass in O'Fallon, Missouri. There will always be time when you are not happy with your services. First you must ask yourself, Did it rain? Perhaps he is behind… If it happens once or twice that’s understandable. Cutting wet grass isn't only harder, it may even be damaging. But if it’s an ongoing issue, then it’s time for a change. After all he needs to be making your life easier, not more difficult. Scenario 2- He scalped the yard! Your precious yard. Not much that can be done here, and he probably doesn’t know any better. Sometimes it may be caused by a crocked or dull blade, or maybe he is cutting too low. In most circumstances however, this is a good sign that’s it’s time to move on. Scenario 3- He spilled gas, fertilizer, and/or weed killer and killed of a patch of the beloved lawn. OK, take a deep breath, we all make mistakes. Give him the opportunity to make it right. And, if he doesn’t have it replaced with new sod or reseeded in a week or so, then it’s time for a new professional. Scenario 4- Your lawn isn’t thick and healthy. Here is the scenario, your lawn care professional is doing a good job on the mowing part. Yet, there are still weeds, and the turf is a bit sparse. That’s a typical scenario. So you have to ask yourself, are you paying him for a turf fertilization and weed control program? If not, then it’s not his fault. On the other hand, if you are paying him for fertilization services. And, still not getting the results you want. It’s often a better idea to have that part performed by a specialist that only does turf applications. And keep the mowing portion with your current guy. Most people don’t know this, but rarely is one lawn care service great at both mowing and fertilizing, they really are two totally different animals that require different disciplines and equipment. One more scenario that I come across all the time…. He won’t mow on Friday’s!!! Most people don’t know this, but the thing is… everyone wants their lawn mowed on Friday! Think about it, everyone wants the lawn cut in time to enjoy the weekend. There is no arguing that a fresh cut lawn can not be beat, but a landscaper cant be everywhere at once. What does this mean for you? This means you may have to pay a premium. If, your scenario isn’t covered here and you want to cut your guy, it would be a good idea to call around, get pricing, and interview other professionals BEFORE you cut him loose. And if you do cut him lose, or need to hire a lawn care professional, check out GreenPal. From Winter Park, Florida, to Bakersfield California, and Richmond, Virginia, we have a wide range of landscapers ready to serve you. Get quotes from the best landscapers in your area in minutes, not days!